combined with pneumatic-hybrid squeegee/flood bar adjustment. Standard features include servo lift, servo indexing and AC electric print heads. Air consumption rates are reduced to the lowest in the industry. 90% fewer pneumatic components than others in its class. This means it uses less air; needs less maintenance with less downtime. 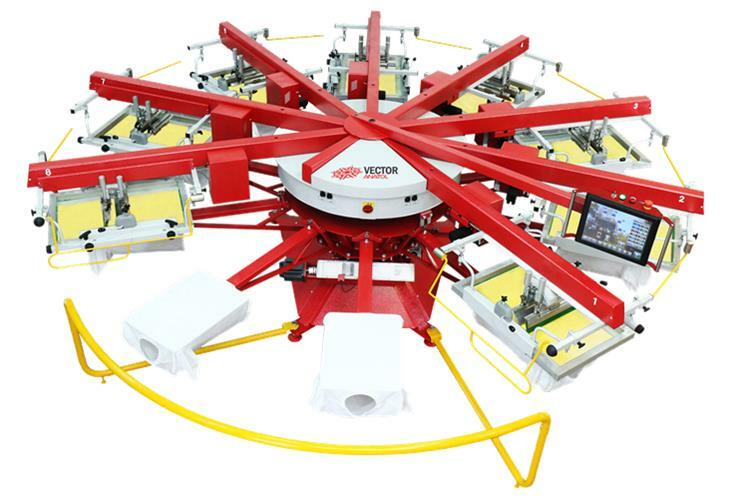 The Vector is Anatol's most versatile automatic machine design. Available in image areas up to 20″ x 28″ and in models from 2 to 18 colors. Feel free to contact us for press features, specifications, and quotation.